“After” photos by Hannah GoeringYard at a GlanceWho lives here: Rick and Lisa Moser, their two dogs, Millie and Annie, and about 20 chickensLocation: Old Mill Creek, Illinois (about 48 miles north of Chicago)Size: About 1/10 acre (405 square meters)Designer: David and Jennifer Hoxsie of Greenhaven LandscapesMaintaining the integrity of the farm’s history was a goal from the start. “We bought the property because we loved it for what it was,” homeowner Rick Moser says. 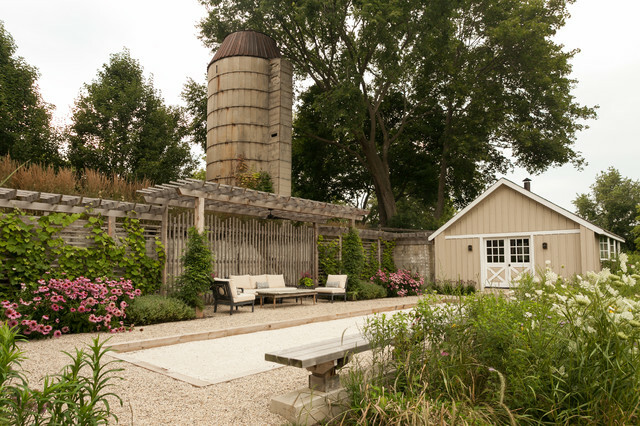 “We wanted to honor its history while bringing some things up to date and realizing some new potential for it as well.”After spending a little over a year working on the house restoration, the Mosers turned their attention to the overgrown garden. They first hired Craig Bergmann Landscape Design to do a master plan of the property and initial plantings around the home. Then, Greenhaven Landscapes came on board to tackle other areas of the grounds, including the bocce court and seating area. arbor to support fence section against high winds. Plant vine to cover arbor and create height. Bocce or horseshoes! And bench.